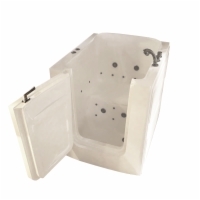 The Easy Soak line of walk in tubs from Sanctuary comes in both Petite and Small sizes. They feature a compact footprint that makes them ideal for small apartments, mobile homes, and other areas where space is at a premium. Both models feature swing-out doors which makes it possible for the tubs to be as small as they are. They are built from acrylic over a stainless steel frame and come enclosed on three sides. The Small Easy Soak features a front door (directly opposite the seat).